trial trip into Canadian waters and reported that everything "was just fine." Bay boom grounds. Then she was sold to Chuck Hanson, who used her in his pile-driving business for about 10 years at Anacortes. Fremont Tugboat purchased her in 1980 and began her reconstruc- tion. Thermal Energy Conversion (OTEC) Project for the Depart- ment of Energy for the last three years. The telephone number at the new office remains unchanged. Cruises as scheduled until No- vember 1982. Nieuw Amsterdam, is scheduled for delivery in January of 1984. The seven largest shipbuilders in Japan have earmarked more than $1 billion (U.S.) for invest- ment in plant and equipment this year, 18.3 percent higher than the investment total a year ago. The higher investment is taken as a sign that Japanese ship- builders are recovering from the recession, according to Tokyo- based Kaiji Press. Kokan Kaisha. Mitsubishi alone is spending almost $200 million on its Yokohama Shipyard. Hitachi has a $21-million project to modernize ship repair facilities at Kanagawa Shipyard. Invest- ment is also taking place in re- search facilities. According to Lloyd's Register of Shipping, Japan leads the world shipbuilding nations. At the end of June, there was 5.6 million tons gross under construc- tion in Japan, 776,000 tons more than at the same time last year. Another 9 million tons was or- dered but not yet under construc- tion—600,000 tons more than last year. In all, the orderbook of 14.6 million tons was 1.3 million tons more than at the end of June 1980. 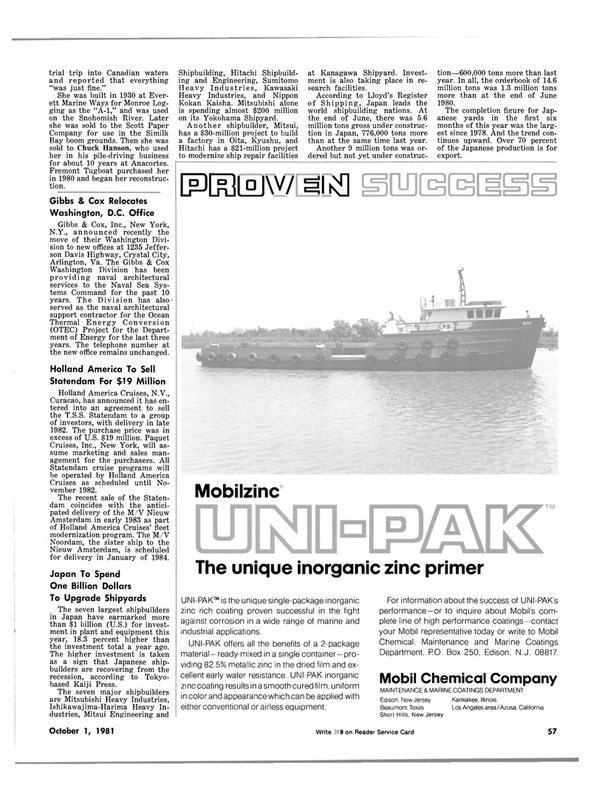 UNI-PAK™ is the unique single-package inorganic zinc rich coating proven successful in the fight against corrosion in a wide range of marine and industrial applications. UNI-PAK offers all the benefits of a 2-package material - ready-mixed in a single container- pro- viding 82.5% metallic zinc in the dried film and ex- cellent early water resistance. UNI-PAK inorganic zinc coating results in a smooth cured film, uniform in color and appearance which can be applied with either conventional or airless equipment. Department, P.O. Box 250, Edison, N.J. 08817.